r3.in.lidar - Creates a 3D raster map from LAS LiDAR points using univariate statistics. The r.in.lidar module is very similar to the r3.in.lidar module and many parts of its documentation apply also for r3.in.lidar. Figure: Proportional count of points per 3D cell. When 50% of all points in a vertical column fall into a given 3D cell, the value is 0.5. Here, the green color was assigned to 0.5, red to 1 and yellow to 0. The figure shows vertical slices and green color indicates high vegetation while red color indicates bare ground. This module is new and partially experimental. Please don't rely on its interface and be critical towards its outputs. Please report issues on the mailing list or in the bug tracker. No reprojection is performed, you need to reproject ahead or use GRASS Location which has the right coordinate system which fits with the data. Some temporary maps are created but not cleaned up. Use of --overwrite might be necessary even when not desired. Expects points to have intensity and causing random (undefined) result for related outputs (sum, mean, proportional_sum) when the intensity is not present but the outputs were requested. 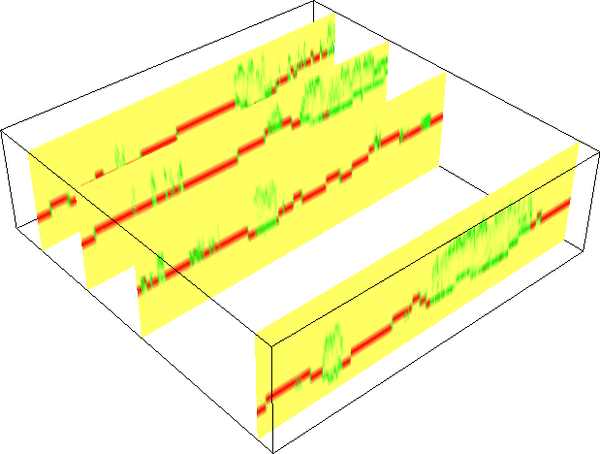 Set the region according to a 2D raster and adding 3D minimum (bottom), maximum (top) and vertical (top-bottom) resolution. Compute the point density of points in 2D while setting the output extent to be based on the data (-e) and the resolution set to a relatively high number (here 10 map units, i.e. meters for metric projections). This step can be repeated with using different resolutions (and the --overwrite flag) to determine the resolution for the further analysis. The class_filter option should be also provided if only part of the points is analyzed, for example class_filter=3,4,5 would be used for low, medium, and high vegetation if the LAS file follows the usedstandard ASPRS class numbers. The following steps are not necessary if the point density is high enough to fill the raster continuously. Now we need to determine upper vertical limit for the 3D raster (the top value from g.region -p3). This can be potentially done with lower resolution. The -d flag ensures that the ground raster will be used in its actual resolution regardless of the resolution of the output. Note that the 2D and 3D resolutions are separate so that user can perform the 2D calculations on a finer resolution than the 3D calculations. The vertical resolution can be and often is set to a different value as well. Here we use the same value for all resolutions for simplicity.